Home › Life in Christ › Friday Morning: 08 Feb 2019 – John 11:1-27 ~ I believe in Jesus! 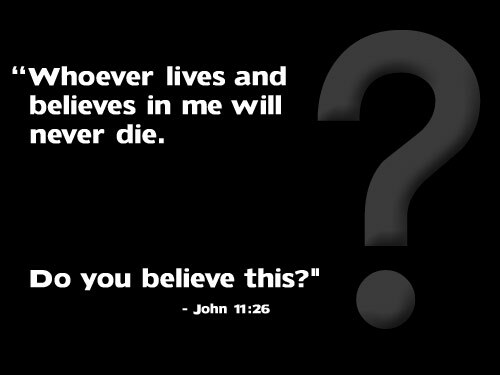 Friday Morning: 08 Feb 2019 – John 11:1-27 ~ I believe in Jesus! How do you face suffering, grief, and trials that threaten to overwhelm you? That’s what Martha was dealing with at the death of her beloved brother. She had hoped Jesus would come in time to save him, but to her dismay, Jesus arrived too late and Lazarus had died. “Lord, if only you had been here, my brother would not have died. + Martha believed that Jesus was her advocate. She brought her troubles to Jesus in order to plead her case before the Father. + Martha believed that God was in control. She believed in God’s sovereignty over all of life’s circumstances. Nothing was impossible for God. + Martha believed that God keeps his promises re: eternal life. She believed in life after death. + Martha believed that Jesus was the Messiah, the Son of God, the one who has come into the world from God. She believed that Jesus was who he said he was. + Martha believed in Jesus for her dead brother’s life. She believed that Jesus was “the resurrection and the life” – that Jesus always has the last word over death. Anyone who believes in me will live, even after dying. Everyone who lives in me and believes in me will never ever die. + Martha believed in Jesus. What do you believe? Can you remember a time when you suffered great loss, or faced overwhelming trials? Perhaps you are going through something like that today? Please explain. Which of Martha’s beliefs did you/do you find helpful? Would you add anything? Please explain. What does living in Jesus and believing in him mean to you? Are you confident that you have eternal life? Please explain. Come to me Lord Jesus in my times of great sorrow and overwhelming trials for I believe in you. You alone have the words of eternal life. You alone are the resurrection and the life. You alone are the one who works out all things for my good and your glory. I believe in you, and I trust you. You alone hold my destiny in your hands. Amen. ‹ Thursday Morning: 07 Feb 2019 – John 10:22-42 ~ I belong to Jesus!